As a special education teacher, we often times are faced with things such as toilet training, potty training or bathroom training, which ever you choose to call it! Either way, it can be a daunting task but the rewards can be life changing for the student and their family. When you think of potty training a two year old, it is often times a full time job with an adult and the child 1:1. It may or may not involve a "no pants method!" This is great for potty training at home, but we all know this is not a realistic approach in the classroom. You are juggling several students, less staff, behavioral outbursts, academic expectations, health needs all while trying to figure out a plan of toilet training. I am going to go over some tips to help it be more feasible in the classroom. 1. First and foremost, your classroom schedule and routine should be well established with a well running classroom. If you have a chaotic classroom and want to try throwing in potty training as well, your classroom infrastructure will crumble. Read more here about how to run a smooth classroom routine. 2. Before you start ANYTHING with any student of yours, please consult the family and confirm that there are no medical needs for the student that may inhibit their ability to be toilet trained. A school/district nurse may be a great resource for you! Some students with health needs may not be ready to be potty trained for reasons out of your control, and this is OKAY. 3. Create a plan with your team. Everyone should be on board. You cannot toilet train at school if parents are not going to continue at home. Your work will be done each night and you will have to start over each morning. This is not fair to the student or YOU! If you are going to start toilet training, communication between home and school is also key. If the kiddo is successful on the toilet, SHARE THIS with the parents. 4. CONSISTENCY is key! Once you decide to toilet train in the classroom, you must commit. Set a plan for how long you are going to try it before you decide to take a break. You can't decide to not "toilet train" today because you are short staffed. You can't only toilet train if you have extra staff or only in the afternoon. That is not fair, what if someone told you that you couldn't go to the bathroom today? If you are going to do it, DO IT RIGHT. I also suggest not starting with ALL of your students at the same time. Stagger the start date. I have found that if you give it a week or two with student A, when you start Student B it won't seem like such a daunting task. 5. Identify which skills you are going to target. Toilet training has a lot of steps that must be mastered and can be daunting. Are students expected to take their bottoms off? Pull them up? Buttons? Or are you going to work simply on voiding in the toilet? There is no wrong way to do this, but it should be consistent. Once one step is mastered, go a head and add some more steps to the mix! It is a misconception that if you are toilet training, the first step they learn must be to take their pants off. ABSOLUTELY NOT! Some students struggle with fine motors and skills such as this may set them up for failure. It is okay to to assist the child with taking their bottoms off and work with them to void and wipe on their own. Independence is independence, in whatever form it may come in. As long as the student is making progress in a way that makes the most sense for them, that is great. Eventually, you will get to the point of the child being able to do all the steps on their own. The length of time this takes will be different for every child. 6. Set up the room. The bathroom is just like your classroom, it should be a supportive and learning environment. If you are toilet training you are most likely using a restroom that you can add visuals too. Whether it be a bathroom in your classroom, a separate bathroom for students that staff can accompany the student to, it should be ready to support all of their needs. Post a visual schedule near the toilet that students can reference when going to the bathroom. Have a visual card handy that staff will be able to use to point to. 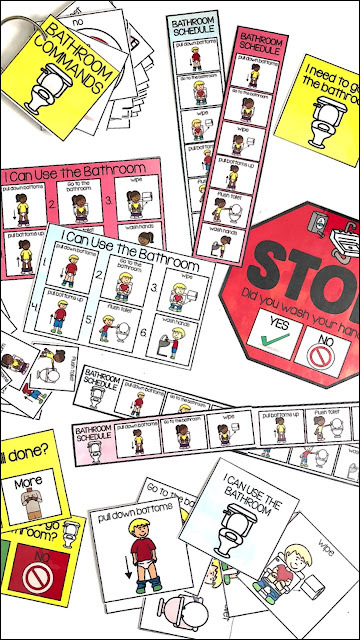 Provide a hand washing visual to help cut down on the verbal prompts while in the restroom. 7. Equip staff with the tools needed to communicate with the student while toilet training. My belief with everything is to use AS LITTLE verbal prompting as possible. Verbal prompts can become SO overstimulating for students. Having a lanyard of visuals for staff to use with students to cut down on verbal prompts can be a great tool. 8. Provide students with an opportunity to communicate their need to use the restroom in the classroom. Provide a visual cue for those students to communicate the need to go to the bathroom! This simple visual I like to use in the restroom is so simple yet so effective. It helps them to communicate if they are done or not when in the restroom. I also have a simple visual in the classroom that staff can use to ask students if they need to go to the bathroom. ALSO, students must be able to communicate when they need to go to the restroom. Some students, whether they are verbal or not, may forget that they CAN ask. I like to give them a "bathroom" card that can be stored in their desk or attached with Velcro to serve as a reminder for them that they can either hand the card or raise their hand and ask. If they ask, RESPECT it. Take them to the restroom. At first it may be annoying while they are learning when to go or not, but if you don't respect their voice, they will give up on asking and toilet training will not be successful. 9. DATA! Collect data to determine students progress! Collect data on students going to the restroom. It's important to track progress to see if they are making progress or not. Depending on the student it may take time to make progress. For me, in general, if I didn't see progress in a month I would stop the toilet training and revisit it in a few months. It's okay to stop and give it some time. 10. Work on these skills outside of the bathroom. Are students able to sequence the steps to going to the bathroom? Do they understand what is expected of them? Review these skills before going to the restroom! I like to use worksheets and file folder activities to help reinforce what it means to go to the bathroom. Looking for bathroom visuals for your classroom? Grab these below! I am SO excited to share with you my full CALM DOWN KIT bundle! Calm Down Kit- 2nd Edition! Assisstive Technology- The Steps to Assessing! © 2015 Autism Adventures. Phoebe Template designed by Georgia Lou Studios All rights reserved. Customized by Erin Hagey.